Despite the extensive work on pathological mechanisms and some recent advances in the treatment of different hematological malignancies, leukemia continues to present a significant challenge being frequently considered as incurable disease. Therefore, the development of novel therapeutic agents with high efficacy and low toxicity is urgently needed to improve the overall survival rate of patients. In this comprehensive review article, the current knowledge about the anticancer activities of flavonoids as plant secondary polyphenolic metabolites in the most commonly used human established leukemia cell lines (HL-60, NB4, KG1a, U937, THP-1, K562, Jurkat, CCRF- CEM, MOLT-3, and MOLT-4) is compiled, revealing clear anti-proliferative, pro-apoptotic, cell cycle arresting, and differentiation inducing effects for certain compounds. 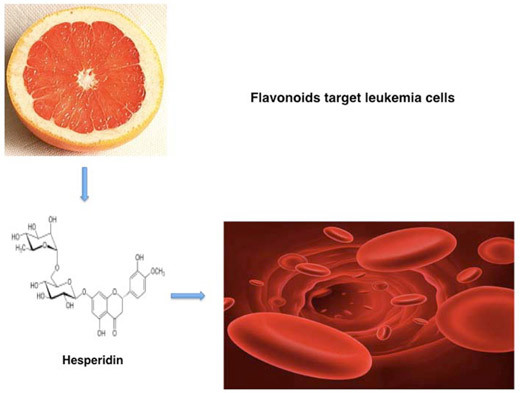 Considering the low toxicity of these substances in normal blood cells, the presented data show a great potential of flavonoids to be developed into novel anti-leukemia agents applicable also in the malignant cells resistant to the current conventional chemotherapeutic drugs. Antiproliferation, Apoptosis, Cell cycle arrest, Cytotoxicity, Differentiation, Flavonoids, Leukemia, Human cell lines. Department of Hematology and Oncology, University of Tartu, L. Puusepa 8, 51014 Tartu, Estonia.